Paloma Clothing is a locally owned women’s boutique in Portland, OR. Whether you are searching for a dress to wear for a special occasion or need casual, American made clothing that you can easily pack in your suitcase for travel, we’ve got it all. You can rest assured we go out of our way to provide excellent customer service, and our selection of high-quality products is socially responsible. We carry top clothing brands in a variety of styles, and the perfect bags and accessories to compliment any look! You’ll love our one-of-a-kind selection of natural fibers, including favorites such as cotton, linen, silk, and wool. We also carry lesser-known materials like ramie (made from nettles), and various forms of wood-based rayon such as Tencel, viscose, and modal. – Cut Loose: Casual clothing cut and dyed to order in San Francisco. – Johnny Was: Collectable pieces made with exquisite embroidery and luxurious fabrics. A perfect balance between vintage, bohemian & modern style. – Nic Zoe: A collection inspired by artists, destinations and life experiences as well as the needs of real women. – 3Dots: A Southern CA designed & created brand that prides itself in providing “Beyond the Basics” luxury comfort and effortless styles. – Luna: Designed & made in Portland, OR by Karina Potestio, who began sewing skirts for her three little girls in her home. – Aventura/ Sportif: Designed in the beautiful Sierra Nevadas, Aventura makes comfortable, stylish organic cotton travel clothing. – Janska: All weather raincoats designed & made in Colorado. Durable, washable & great for travel! – Prairie Underground: Made in Seattle by two best friends from Nebraska, these limited edition styles are made with organic cotton. – Tianello: Features unique prints and specializes in Tencel fibers. – Habitat Clothes: Timeless designs ranging from casual to dressy. We feature a great selection of accessories including travel bags and handbags from Baggallini, Hobo, and Sven. You’ll find gorgeous scarves from Asian Eye, Dana Herbert, and Dunlap Weavers. We also pride ourselves on our selection of unique locally made jewelry from designers such as Boma, Elysium, Kristin Ford, Marjorie Baer, and Sarah J. Jewelry. Stop in today to find new eco-friendly clothing as well as trendy and designer outfits. Find out why we are the preferred destination for special occasion clothing in Portland. Our boutique has a wide range of appealing, socially responsible clothing to pick from. 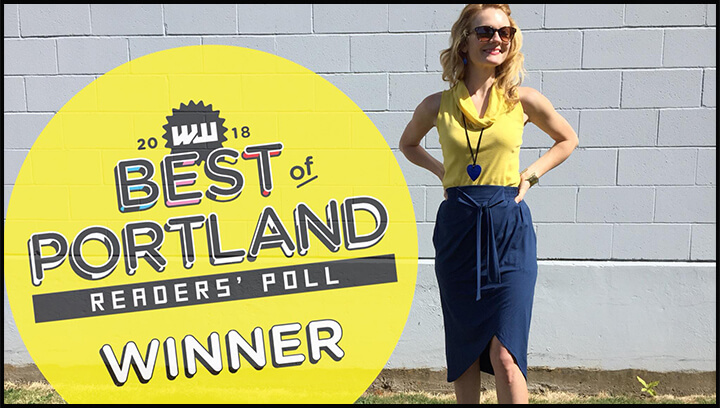 Check out the locally made jewelry and the best accessories in Portland. Browse photos of our stylish clothing for Travel, Work & Play.